You may have noticed that I am a fan of quick breads. What’s not to love about an easy to make sweet that mixes up fast and pops out of its loaf pan less than an hour later? This particular loaf was borne of a curiosity (if lemon loaf is good, them wouldn’t grapefruit loaf be good too? hmmm …..) and an abundance of grapefruit. 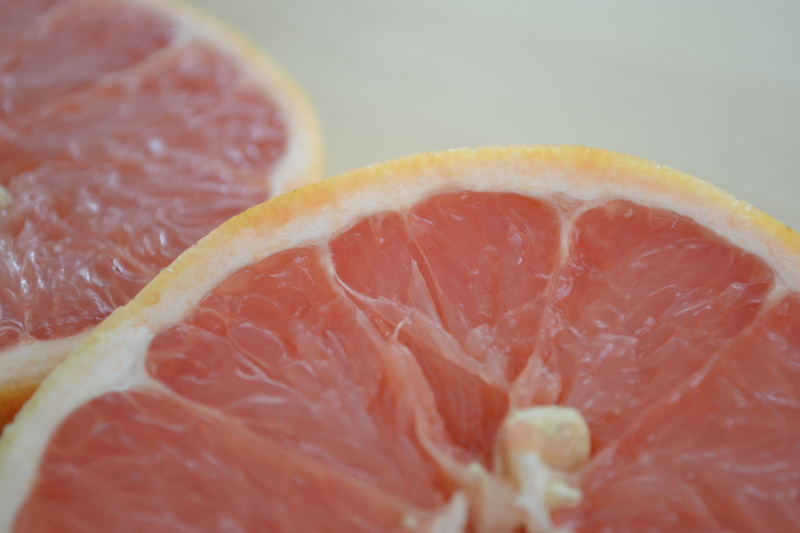 We have been eating ruby grapefruits a lot in the last few weeks and although they are more tedious to eat (if you’re nuts like me and you can’t bear to eat any pith or membrane because all you want is the sweet, juicy flesh). They have been very enjoyable and a nice break from oranges. We are also beginning the process of transforming our useless swamp of a back yard into an agricultural oasis. This urban gardening experience is happening in part because we have opened it up to some apartment dwelling friends with green thumbs, thereby creating a community garden, literally in our own back yard. In anticipation of brunch and our first day out in the yard, I wanted to try out a new recipe or two and since there were no lemons to speak of in the house, but about a dozen plump, ripe, pink and delicious grapefruits I thought I’d try to see what I could do with them. 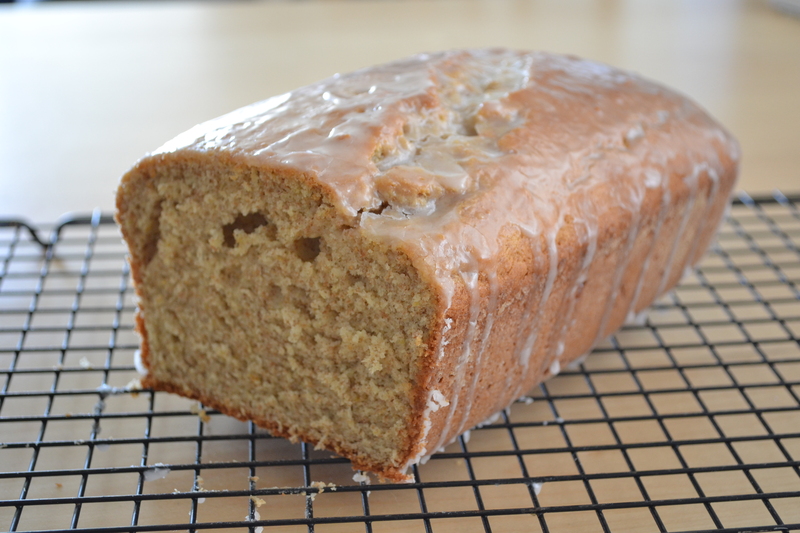 This is by no means a way to use up a plethora of grapefruits (I only needed one) but this humble, hearty loaf does pack a nice citrus punch, and the shamelessly sugary glaze helps you forget that its whole wheat. If you’re feeling hesitant about the whole wheat flour, or you just don’t have any one hand, there is no reason not to use plain all purpose flour. Likewise, cake flour would yield an even more refined crumb. 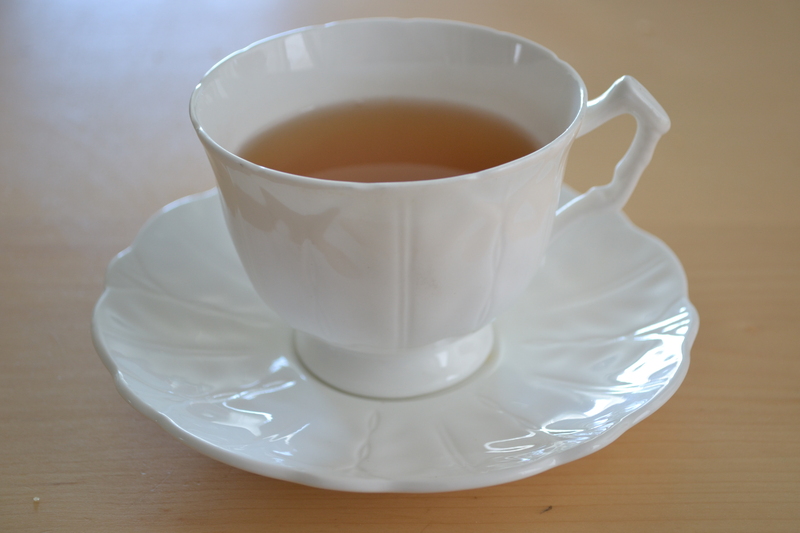 Either way, it’s just the thing with a strong cup of tea. Cream butter and sugar together with electric mixer until fluffy. Add eggs, one at a time, fully incorporating each one before adding the next one. Add the zest. Beat until pale in colour and fluffy, about 3 minutes. Add the grapefruit juice and milk slowly to the butter mixture with the mixer running — it may curdle slightly — don’t be alarmed, it will be fine in the end. Add the dry ingredients, one half at a time, alternating with the sour cream. Mix gently until fully combined. Scrape into 2 greased and floured loaf pans. Bake at 350 degrees for 45 minutes or until a skewer inserted in the center comes out clean. Tip out of the loaf pans onto a wire rack and allow to cool for 5 minutes before glazing. 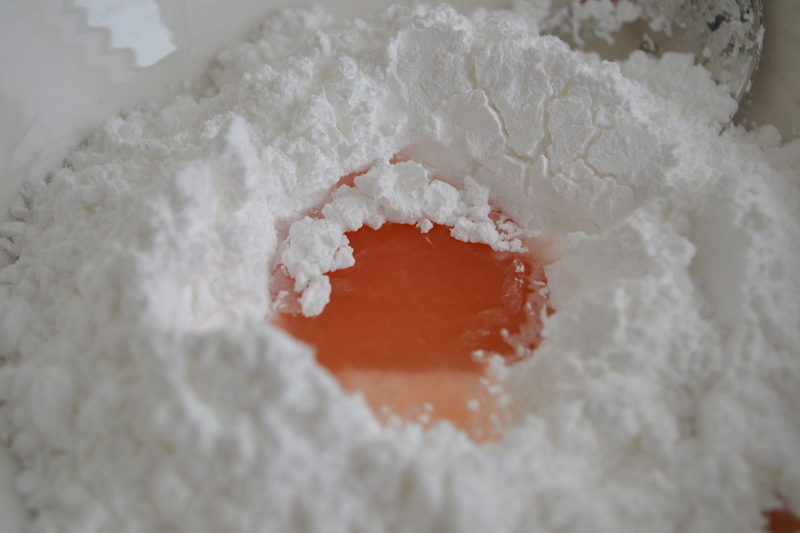 Glazing while warm allows the glaze to be partly absorbed into the cake. 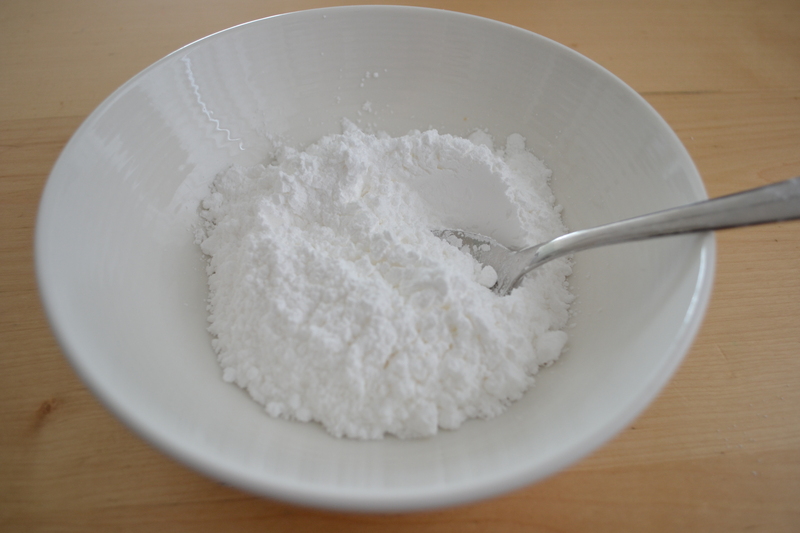 Scoop 6 tablespoons of icing sugar into a bowl. 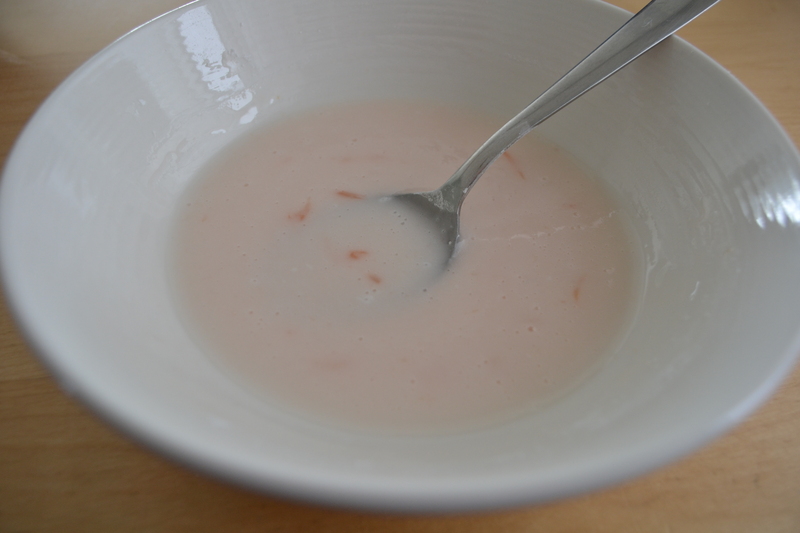 Pour in a few tablespoons of grapefruit juice and stir. Aim for the texture of whipping cream, or slightly thicker. Pour slowly over warm cake allowing the glaze to soak in.